Based on John Boyne's book of the same name, The Boy In The Striped Pyjamas follows Bruno (Asa Butterfield) as he moves from his Berlin townhouse to the countryside for his Father's (David Thlewis) new army posting during the Second World War. Focusing on Bruno we also see the effect the move will have on his Sister (Amber Beattie) and Mother (Vera Farmiga) as well as Bruno's new found friend (Jack Scanlon). When I sat down to write my thoughts on John Boyne's book I found it a remarkably difficult novel to like. It wasn't necessarily the content or the particularly hard to swallow conclusion, it was more the tone and style of it. The book presented itself absolutely from young Bruno's point of view which was sweet and ironic in equal measure, Bruno's constant mispronunciations giving us a unique world view that only an 11 year-old could have (The Fuhrer for example became 'The Fury'). But then the book expected you, and more to the point, the youngsters it was aimed at, to swallow a remarkably harsh message about innocence and family, lost and destroyed. It didn't sit right and smacked of dual standards - an adult fable presented as a child's story, to children. I'm pleased to report that the film manages the books themes much better. The sense of innocence lost and of the eventual destruction of a family are played out realistically whilst still retaining the innocent view of Bruno and, to a greater degree than the book, his sister Gretel. Bruno's rebellion on screen is much more understandable as are certain actions he chooses to take in the coldly modern art-deco house Director Mark Herman imprisons the family in. There are still problems however. I'm still not 100% sure who the story is aimed at. The childlike elements of the tale and the isolation and displacement Bruno feels will appeal to younger audiences but the more subtle themes about the influence of Nazism and the aforementioned innocence lost are still placed more towards a later-teenage market. Crucially, the books conclusion is retained and it doesn't lose any of its resonance or shock. It is grim and disturbing and an extremely brave move from the filmmakers to stick with it. 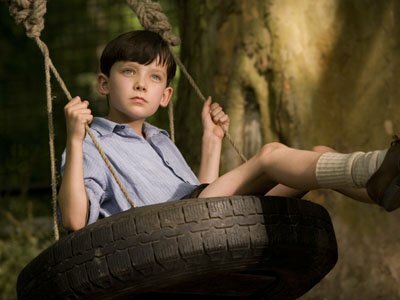 Whilst it is difficult to criticise child actors, Jack Scanlon as Bruno's friend Shmuel just doesn't bear up to Asa Butterfield and as a result the scenes between the two of them occasionally feel forced and trite. Elswhere, Herman makes some great decisions and sticks remarkably closely to the text but I couldn't help feeling that he missed a trick in failing to extend the already under-developed characters of Pavel (who is possibly under-developed on purpose) and, even more so the maid Maria (Cara Horgen). Maria especially is the kind of 'sees all' servant who has a special affinity with Bruno that we only ever catch glimpses of. Herman allows these glimpses to permeate but then, despite her presence at the conclusion, completely denies us her reactions, condemning her to being just another silent female film character. Superior to the book then, Herman's film is brave and occasionally gripping, making significant and calculated decisions along the way, leading us to a devastating conclusion and fitting portrayal of a number of childhoods lost.